People ask me all the time why I spend time writing this blog and sharing my “secrets”. They want to know “What’s in it for me” especially since I’m not constantly selling webinars or in other ways asking you to open your wallet. So I thought I’d take a minute and give you a peek behind the curtain. Blogging makes me think better. Working with an idea enough to clearly communicate it to someone else, in writing, takes my ideas to another level. Knowing that there are people like you reading, watching, or listening to what I have to say makes me try harder. I win because I end up having more insights than I can put on the page. Blogging opens me up to new friends. Here’s how that works. Someone like you reads my blog and something strikes you and you either comment or email me. That back and forth interaction leads to a higher trust level and maybe a few more exchanges. Then we make a point of meeting in person the next time we are both at an industry event. Sometimes there is no industry event, but we start to interact on Twitter. It all comes full circle when one day when I need help with a thorny issue and I reach back out to my friends in the industry. I believe that I can never have too many friends, and my blog is a way to start those relationships and give before I need to receive. Blogging helps me build my own reputation on my terms. I get to make an impression on a lot of people (for better or worse). Blogging helps me get into the community of my peers in the self storage industry in a very leveraged way. My blog gives people a glimpse into my head and also gives them something to talk about. On this same note, I’ve been invited to speak at several ISS conferences, for the California Self Storage Association, and for the Texas Self Storage Association. I probably wouldn’t have been on anyone’s radar without my blog. I believe that activity breeds opportunity, and I anticipate that blogging has only begun to open doors for interesting opportunities. How many people do you know that have an “audience”? Blogging paid for my trip to Disneyland with my 5 (soon to be 6) kids back in 2010. Although most of what I produce is free, I do sell stuff. My most popular thing so far has been my Follow Up Workshop. I sold about $10,000 worth in 2010 and early 2011 (I’m sure this will get out of date, but oh well). I promise a 100% satisfaction guarantee, no questions asked. No one has asked for their money back yet, so I must be doing something right on this one. My blogging has made me a better internet marketer in my traditional self storage business. The intimate experience using web tools and promoting on the internet makes me more savvy about what I can do with my self storage website to drive more traffic and rent more units. Figuring out how to use and leverage a blog and other social media channels pays dividends in more rentals and better web presence for Storage Kings. The feedback to my blog is overwhelmingly positive. I have an ego just like everyone else and the positive feedback gives me an emotional boost. That’s why I do it. I’ll probably update this from time to time (like if my blog gets me invited to Good Morning America or something). 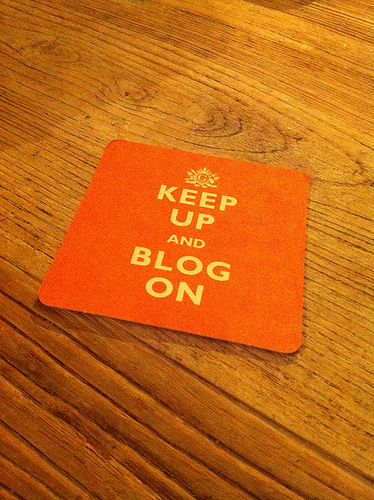 If you blog, I’d love to hear why you do it and post a link too (please). You’re absolutely right about “building your reputation.” Your blog posts caught my attention and I started reposting them on the TSSA facebook page and I mentioned the “great topics” to the powers-that-be. Next thing you know, Kenny is one of our favorite speakers! I like that your topics are self-storage centric, infinitely relatable with easy to implement action steps. I look forward to each of your posts, so blog on Kenny!